Newark, NJ – Essex County Executive Joseph N. DiVincenzo, Jr. hosted the County’s Annual Latino Heritage Celebration on Friday, September 16th in the Essex County Hall of Records. With an array of colorful flags representing 22 Latino countries as the backdrop, DiVincenzo led a spirited celebration to pay homage to the rich culture and traditions of U.S. residents who trace their roots to the Spanish speaking nations of Europe, Central America, South America and the Caribbean. 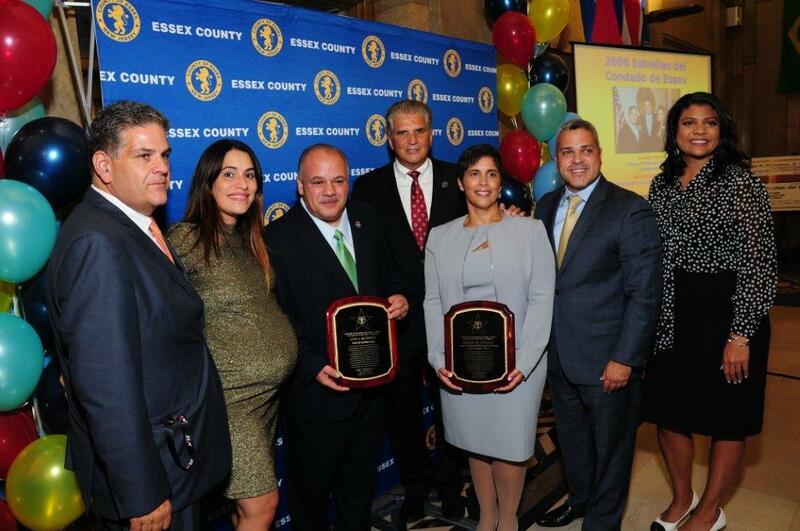 During the program, DiVincenzo presented the County’s 2016 Estrella del Condado de Essex Awards (Stars of Essex County) to Shirley M. Collado, PhD, Executive Vice Chancellor and Chief Operating Officer of Rutgers University-Newark, and the Honorable Luis A. Quintana, Newark Councilman At-Large, for their commitment to improving the lives of all residents, their leadership, and dedication to public service. “We are honored to recognize Shirley M. Collado and Luis A. Quintana for their commitment to improving the lives of all residents, their leadership, and dedication to public service,” said DiVincenzo. “Our cultural celebrations give us the opportunity to highlight the achievements of individuals from many different backgrounds, and learn about their heritage as well,” he noted. Shirley M. Collado, PhD, joined Rutgers University-Newark in 2015 and currently serves as Executive Vice Chancellor and Chief Operating Officer, and Associate Professor of Sociology. In these dual roles, Dr. Collado leads the implementation of key elements of the university’s strategic plan and oversees academic affairs, student affairs and core institutional operations, including academic services, enrollment services, student life, human resources, facilities, information technology, and budget and finance. Dr. Collado is a clinical psychologist with a specialty in trauma among multicultural populations and a national thought leader on diversity, collaboration and innovation. She has taught at a number of colleges and universities, including New York University, Georgetown University, George Mason University, The New School, Middlebury College and Lafayette College and continues her research and teaching pursuits at RU-N as a faculty member of the Department of Sociology and Anthropology with an affiliation in the Department of Psychology. Prior to her appointment at Rutgers-Newark, she was vice president for student affairs, dean and associate professor of psychology at Middlebury College where she managed numerous departments and offices. At Middlebury, she successfully led transformative initiatives including the enhancement of the Center for Careers and Internships, the development of the Center for the Comparative Study of Race and Ethnicity, the strengthening of The Commons residential life experience, the development of forward-looking sexual misconduct and judicial policies, the establishment of faculty diversity and retention initiatives, and the initiation of a nationally recognized student orientation program (MiddView). Dr. Collado previously served as the executive vice president of The Posse Foundation, where she significantly grew the organization and managed operations on a national level. The Posse Foundation is a not-for-profit organization and one of the most comprehensive college access programs in the country. A member of The Posse Foundation’s inaugural class of students and a Brooklyn-born daughter of Dominican immigrants, Collado is the first person in her family to attend college, having earned her undergraduate degree in Human & Organizational Development and Psychology from Vanderbilt University in 1994, followed by M.A. and Ph.D. degrees in Clinical Psychology from Duke University. Moreover, Collado is the first Posse Scholar to receive a doctoral degree and become a trustee of an institution of higher education, Vanderbilt University. Dr. Collado is currently developing and leading the Creating Connections Consortium (C3), one of the most innovative faculty diversity initiatives in higher education. Under her leadership as co-principal investigator of C3 and with a major grant from The Andrew W. Mellon Foundation, C3 is building a dynamic partnership to strengthen diversity and innovation and to broaden the pathway to the professoriate through enhanced interactions between liberal arts colleges and research universities. She also co-founded and co-led the national organization of Liberal Arts Diversity Officers (LADO), a national consortium that promotes the advancement of diversity, equity and inclusion in support of academic excellence at liberal arts colleges. She resides in South Orange with her husband, A. Van Jordan, an award-winning poet and the first Henry Rutgers Presidential Professor at Rutgers University. “Essex County, Rutgers University-Newark and the City of Newark have really embraced me and this is now my home. Thank you to County Executive DiVincenzo for this great honor. I am so proud of everything going on here,” said Collado. “The bus ride I took from Brooklyn, NY, to Vanderbilt University as a member of the Posse Foundation changed my life. That bus ride has defined everything I did as the first person in my family to graduate from college and professionally as I work diligently to provide opportunities for students,” she added. Luis Quintana was elected to his first term as Newark Councilman-at-Large in June 1994 and has served the City of Newark as Councilman-at-Large for 22 years. Mr. Quintana was the first Hispanic to serve as Councilman-at-Large, City Council President and Mayor. Councilman Quintana was born in Añasco, Puerto Rico, and, in 1967, at the age of 8, he moved with his family to Newark. Challenged by his new environment, the young Quintana, who could not speak or understand English, was determined to learn and achieve his goals. He received a Bachelor of Arts Degree in Criminal Justice from Seton Hall University in 1983. After his graduation, motivated by his concern that all Newark children receive a decent education regardless of race, creed or color, Mr. Quintana became a Youth Counselor at The North Ward Center in Newark. As Youth Advocate, he worked with the Essex Council Boys Scouts of America, The Explorers, Rick Cerone Little League, Girl’s and Boy’s Clubs of Newark and the Urban Youth Task Force. He has served as President and Advisor to the Newark Police Explorers, Post 522. Mr. Quintana has been a member of the Essex County Vocational Technical School Board and the Board of Trustees of the United Way. He is an elected Member of the National Association of Latino Elected and Appointed Officials Educational Fund and the Board of Directors of Hispanic Elected and Local Officials, where he became the first Hispanic of Puerto Rican ethnicity from the Northeast to be elected President. He also serves on the Black & Latino Coalitions of Black & Hispanic Clergy, the Sister Cities International, the New Jersey Commission on Holocaust Education, and the Board of the National League of Cities and the Salvation Army. He is the Chairman of The Three Kings Celebration, Inc., a non-profit association that assists children and senior citizens. Councilman Quintana has received numerous awards and recognitions, including the dedication of the 2014 Anasco, Puerto Rico, Saint Anthony Festival in his honor, the Mayoral Recognition from Mayor Wilda Diaz of Perth Amboy, a Men of Valor Award, the 2008 Senator Weinberg Icon Ally Award and the Ambassador for Peace Award from the Interreligious & International Federation for World Peace among several others. “Having arrived here as a youngster who did not speak or understand English, I had to work hard to become successful. I have learned a lot through service, which allowed me to achieve. I believe that it’s not about bragging about achievements, it’s about doing the work within our communities,” said Quintana. “Thank you, Joe DiVincenzo, for this great honor,” he added. Minister Maria Ortiz from Christian Love Baptist Church in Irvington delivered the program’s invocation. Entertainment was provided by students from Arts High School in Newark. The Latino Heritage Month Celebration is the part of a year-long cultural series created by County Executive DiVincenzo to highlight Essex County’s diversity. Other cultural heritage celebrations include African American History Month, Irish Heritage Month, Women’s History Month, Italian Heritage Month, Jewish Heritage and Portuguese Heritage.